A full-color glossy magazine, published 6 times per year, that provides preseason previews of NC State’s basketball, football and Olympic sports teams, as well as feature stories and recruiting coverage. Eliminate the wait for postal delivery! 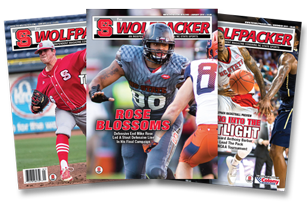 Now you can receive The Wolfpacker magazine on your computer and tablet at your home or office as soon as it is published! The electronic edition is identical to the print version. Our pages will explode before your eyes and can be viewed in the exact format of our print publication.